Location based Socializing, just Accept It! Ok so we’ve finally embraced social media in the auto industry, well at least a good portion. Now of course you realize that social networks just like your internet marketing strategies are constantly needing fine tuning because of the forever changing trends. If you’ve read previous postings ago that location based socializing such as “foursquare” is the new craze for socialites. Well, no surprise that Facebook has adopted this trend. So think again of some creative ways to use this to your dealerships advantage! The company does plan to roll out Android() and BlackBerry versions of Places, but they haven’t released any specific dates for those releases yet. 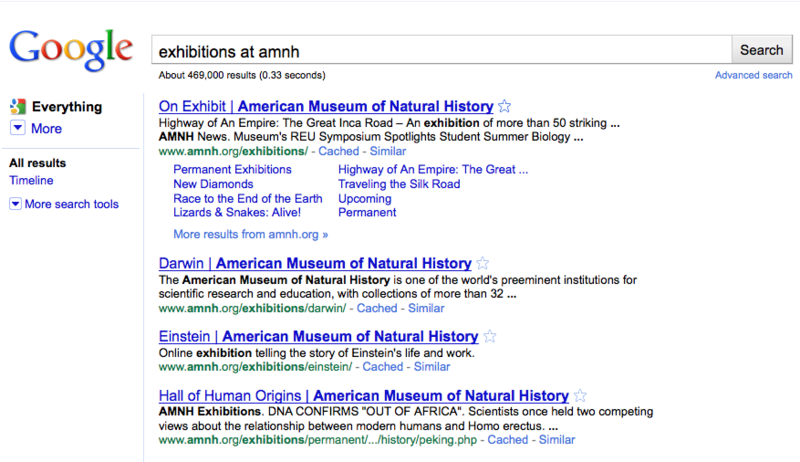 Prior to today’s change, only two results from http://www.amnh.org would have appeared for this query. Now, we determine that the user is likely interested in the Museum of Natural History’s website, so seven results from the amnh.org domain appear. Since the user is looking for exhibitions at the museum, it’s far more likely that they’ll find what they’re looking for, faster. The last few results for this query are from other sites, preserving some diversity in the results. This is great news in the automotive world. But of course if your site architecture still isn’t “search engine friendly” then you’re definitely going to miss out. Those that 100% believe in the value of SEO and a comprehensive social media strategy will begin to local internet dominance over their competitors! Found this great blog on ADPsocial.com. In the automotive space as we begin to strengthen our social presence we must pay close attention to the audience we’re engaging. This is valuable information for you to know, now think of the messaging you’re putting out there.